The worth 4 dot is simple tool for assessing suppression and fusion. 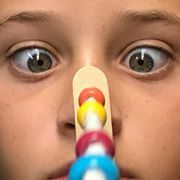 The results o f the quick assessment can give us clues to the function of the eyes. 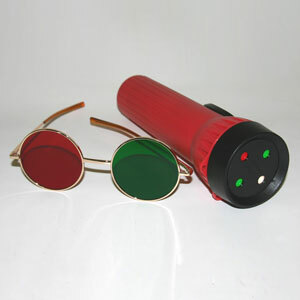 The worth 4 dot (W4D) test is is made up of a pair of red-green glasses and light with 4 dots, 2 green, one red and one white. The patient puts on the glasses and the light in placed near (40cm or less) and asked how many lights they see. It is then moved to distance (1 M) and asked once again how many lights are seen. There are 4 appropriate responses. Other responses should be considered a failure of the patient to understand the instructions. 4 lights, near and/or far indicate using both eyes. I will ask if the lights are moving or not to see if the fusion is steady. 3 lights or two lights- three light indicates suppression of one eye. Which eye depends on the red green arrange of the particular test one is using. They may suppress at near or far or both, so an answer of 3 close and 2 far would be appropriate. 5 lights- a response of 5 lights indicates the patient is having double vision at the range. It may be near or far or both. The W4D is usually the first test I do as it gives me early clues what to look for as I begin looking at eye movements. This test can also indicate how a patient may do on stereopsis testing as suppression of of an eye could me reduced stereopsis. Worth 4 dot is available from Bernell.com. There are several version but the idea is the same for all. 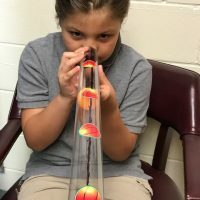 This entry was posted in occupational therapy, suppression and tagged convergence, EOM assessment, eye movements, pediatric optometry, vergence, vision, vision assessment, vision rehabilitation. Bookmark the permalink.